ENJOY Sleepwish Beach Towel, Beach Blanket,Stylish Sheet, Tapetry, Roundie Beach Throw Blanket. There are many different designs to choosefrom. Please click our brand name "Sleepwish" to find more patterns. Not just a beach round tapestries or round beach blanket! Sleepwish skull tapestry can even be used as a beautiful throw or tapestry for your indoor decor. 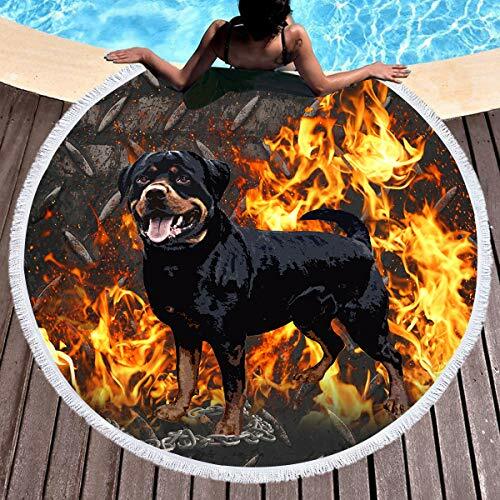 Round, XL oversized towel, 60 inches in diameter (1.5m) with tassels, large enough to hold two people sitting on it or one laying down. Easy to carry around as it's light and occupies very little space when you fold and pack it. MICROFIBRE towel with fringe around the outside, we already taken photo for fabric detail. Right thickness, it can absorb 4 - 7 times its weight in water, more than twice as much as ordinary cotton. That's why it works perfectly as beach& travel towel and why it dries off so fast. It's soft and large enough to use for beach throw, camping blanket, table cloth, covering chairs, bath towel, furniture throw, throw wall hanging, home floor, yoga sheet, and shading sleeping babies.